In Maharashtra Haldikunku is performed in the month of Chaitra as per Hindu calender. Amba dal & Panhe are served on this occasion with flowers!! 1. Soak chana dal in water for 4-5 hours. Drain the water. Grind the soaked dal coarsely. 2. Add green chilli, grated green mango & salt in the ground chana dal. Mix properly. Keep aside. 3. Add oil in a thick bottom pan.When oil becomes hot add mustard seeds, cumin seeds, turmeric powder & hing one by one. Add curry leaves. 5. Let it cool. Then add in the chana dal mixture. Mix everything properly. 6. Add coriander leaves & mix. I took 2 totapuri green mangoes. 1. Remove the skin of green mangoes. Soak the saffron threads in 1 tsp of hot water. 2. Take the mangoes in a vessel. Add jaggery in the same. 3. Pressure cook the mango jaggery mixture for 3 whistles. 4. Let it cool. Remove the seeds of mango. 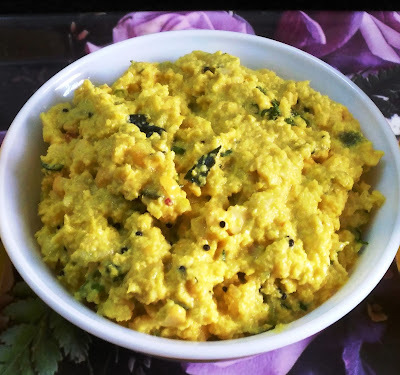 grind the mango pulp with jaggery to fine paste. 5. Add cold water & adjust the consistency like sharbat or as you like. Add more jaggery if required. 6. Add cardamom powder, soaked saffron in the above mixture. Enjoy Amba dal & flavourful cool panhe !! Today I tried orange & tuti fruity sponge cake in my mini bundt cake pan !! It came out very soft & yummy !! 1. Powder the sugar in mixer. Add in a bowl. Add yogurt & mix well till sugar dissolves. 2. Add baking powder & baking soda & mix again. Add vinegar, mix & keep for 2-4 minutes. You will observe air bubbles. 3. Add oil & pineapple essence. Mix well. Add orange rinds & orange juice. 4. Add maida & fold gently. Add tuti fruity. 5. Mix well. Pour the mixture in cake pan. Preaheat the oven for 10 minutes. 6. Bake the cake in greased tin in the preheated oven at 180 C for 20 to 25 minutes or till light brown. Enjoy this yummy homemade stuffed baked kulcha !! Add all the ingredients in a bowl & mix well to prepare nice stuffing. 5. Add salt,olive oil, flour & maida in the above mixture . Mix to make a nice dough. 9. Punch the dough & again knead for about 2 minutes. 10. Prepare 8-12 small balls. With the help of rolling pin or even with hands prepare discs about 1/8 inch thick. 11. Take a small portion of potato stuffing & fill in the disc. Close the disc from all sides with stuffing & again spread it to make about 4 to 6 inch disc kulcha or the size you want. sprinkle with sesame seeds, coriander leaves & mint leaves. 11. Bake the kulcha in preheated oven at 180 C for 10 minutes or till light brown . 15. Apply butter on the kulcha when it is hot. Keep in the basket covered with napkin. Enjoy hot home made soft kulcha with any vegetable or with yogurt !! Or you can it it simply with butter or desi ghee. This recipe is very simple & easy & laddus are very healthy. Ideal for snacking to anybody ! No need of preparing syrup ( pak) ! Anybody can prepare it ! Add all above ingredients in mixer jar except black raisins. Grind to coarse powder. Add raisins & roll the laddus in the shape you like. Enjoy these soft tasty & easy laddus. 4. Add little water in properly cooked toor dal. Prepare smooth mixture with water. 5. Add this dal in the pan. Add jaggery & salt. Add red chilli powder. 6. Add goda masala & coconut. Mix & let it cook. 7. Add water. Let the dal boil on medium flame. Then on lower flame let it simmer for 5 minutes. 8. Consistency of this dal is not very thick like dal fry. Garnish with coriander leaves. Enjoy this tasty amti with hot rice or phulka.